By comparing the result of online IP checkers when accessed using http vs http, as most intercepting proxies do not intercept SSL. If there is suspicion of SSL being intercepted, one can examine the certificate associated with any secure web site, the root certificate should indicate whether it was issued for the purpose of intercepting. 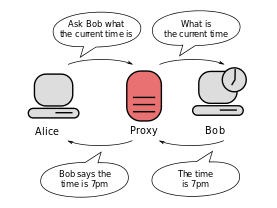 A suffix proxy allows a user to access web content by appending the name of the proxy server to the URL of the requested content (e.g. "en.turkcewiki.org.SuffixProxy.com"). Suffix proxy servers are easier to use than regular proxy servers but they do not offer high levels of anonymity and their primary use is for bypassing web filters. However, this is rarely used due to more advanced web filters.